Low-cost microchipping for cats and dogs at our Community Vet Clinic in Kensal Green, North London. Microchipping your pet is vital as thousands of cats and dogs are lost each year in the UK. At Mayhew, we offer low-cost microchipping at our Community Vet Clinic. Microchipping not only helps to reunite more animals with their owners, but also helps hold people accountable who have abandoned or mistreated their animals. It is compulsory for all dogs in England and Wales to be microchipped. Thousands of cats and dogs are lost each year in the UK and many are never reunited with their owners as they have no permanent identification. Microchipping is the safest way to ensure they can always get back to you when lost. Microchipping is cheap, harmless, and takes seconds. A small chip (the size of a grain of rice) will be implanted into the back of your pet’s neck with a unique number on it. This procedure will take place with them fully awake and is very similar to giving an injection and cats and dogs tolerate it incredibly well. The unique microchip number is then stored on a central database with your name and address details attached. For further peace of mind, the general public are unable to access this confidential database, only registered organisations with the necessary security clearance. Microchipping is a legal requirement for all dogs. 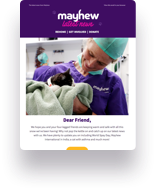 Microchips can be implanted in conscious animals or whilst they are under general anaesthesia for a neutering procedure at Mayhew. Please note, puppies have to be microchipped by law by the age of 8 weeks so microchips will be implanted conscious. Please call or email to book your vaccination appointment.